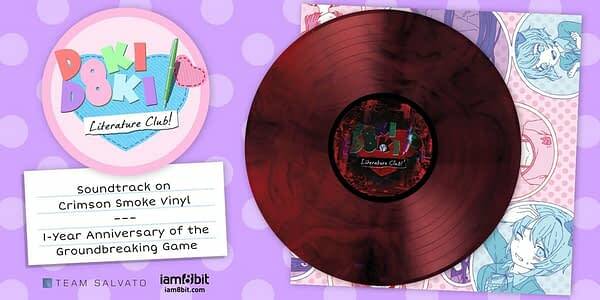 To mark the one-year anniversary of Doki Doki Literature Club, iam8bit and Team Salvato will be releasing the soundtrack on vinyl. The album, as you can see here, will be in red smoke vinyl, include a digital download, and have the complete soundtrack from Dan Salvato with album artwork from OMOCAT. You can currently pre-order it for $28 to be shipped in the first quarter of 2019. Here’s a description of the soundtrack from the label. The soundtrack to Doki Doki Literature Club transforms and morphs as much as the game itself. The music is so directly evocative of an entire genre – the Japanese Dating Simulation – with its resoundingly quirky and upbeat tone, while also veering into territory that is almost impossible to encapsulate. In moments, those pastel notes of sunshine and cuteness turn into somber, emotional and deeply-wrought darkness/weirdness/something else. Therein lies the secret to this album’s success – it is a brilliant exercise in the complete surrender of your soul. Very few soundtracks achieve such a feat, whereas Doki Doki does it with surprising and striking success.